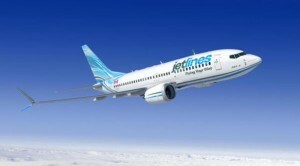 Boeing and Jetlines today announced an order for five 737 MAX 7s as the new Canadian ultra-low cost carrier builds its future fleet. The order, valued at $438 million at current list prices, includes purchase rights for an additional 16 737 MAXs. The new airline, headquartered in Vancouver, British Columbia, plans to tap into passenger demand by offering low cost airfares on routes that avoid direct competition with other airlines. The 737 MAX incorporates the latest technology CFM International LEAP-1B engines, Advanced Technology winglets and other improvements to deliver the highest efficiency, reliability and passenger comfort in the single-aisle market. The 737 MAX 7 will be capable of flying more than 3,800 nautical miles, extending the range over today’s 737-700 by approximately 400 nautical miles (741km). With this order, the 737 MAX has orders for 2,562 airplanes from 55 customers worldwide.